Visuals have a huge impact in marketing. Not only do they make content more sharable -- 40 times as much -- but they help us retain information. When details are paired with an image, we remember 55% more of it. That can be pulled off with infographics -- the nifty images that visually break down complex statistics. They're customizable, sharable, and they're easier to create than you might think. Sure, you could hire a professional to create the infographics for you. But if you're restricted by budgets or time, there are some great DIY resources out there for making compelling visuals. 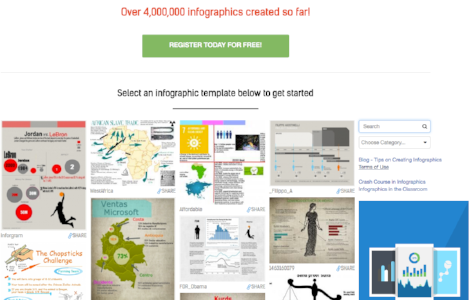 Save countless hours using these free, pre-made templates to design your infographics. Once you’ve let Canva know what you want to do, the site generates several templates you can use as a foundation for your infographic. Plus, it’s got a library of roughly 1,000,000 images that you can add to your project. Similar to Canva, Piktochart can be used to design more than just infographics -- it can also build reports, presentations, and posters. But the templates available for infographics are numerous, and there’s an upgrade available. “Pro” memberships -- which run between $15-$30, depending on the features you want -- allow access to even more templates, as well as removed watermarks and hi-res downloads. When it comes to creating the infographic itself, the features are fairly similar to Canva’s -- the background, text, and images can all be changed, or users can upload their own files for greater personalization. Like its predecessors above, Venngage has quite a few design features, including its great social media templates, which users can download to create their own personalized Instagram posts, blog headers, and more. Upon visiting Easel.ly's website, you're immediately presented with a plethora of infographic templates, most of which can be immediately clicked and customized without having to create an account. If you want to save and share your work, though, you will have to join -- for free. Unlike its predecessors listed here, Easel.ly seems to be a no-frills platform that's comprised of infographics. You can choose which category you'd like, but it's not quite as organized as some other sites -- the drop-down menu is a bit hidden to the left of the templates. Still, most of templates appear to be available for free (more become available with a Pro membership), and they're fairly easy to edit. As its name suggests, Freepik is a resource for, well, free pictures. Infographics are just one type, but after performing a search for them, there are plenty of options -- most of which are complimentary. The only drawback? Freepik doesn't quite allow the same level of customization that some others in this list do. You can download the images for free, but you’ll need a vector graphics editor in order to customize them -- Brittany Leaning and Megan Conley of HubSpot's content marketing team both suggest using Adobe Illustrator. Like many of its visual peers, Infogram is a resource that helps users create both picturesque charts and infographics. It's definitely one of the more "grown-up" sites available for building these images, which might explain why very few of their tools a re free -- including restricting your work from public consumption. However, Infogram also has the option of enlisting professional help with infographic design. So if you're short on time and have a bit of room in your budget, this route might be the best one for you. At the very top of Zanifesto's website, there's bold red banner that reads, "Create something." Love at first visual, if you ask us. When you click on that banner, a list of pricing options appear, one of which is free and all of which are reasonable. The only drawback? It looks like you have to create an account to access any of the resources, even the free ones. Plus, the free option restricts you from being able to uploading any custom graphics. But once you do create a free account, there are plenty of template options and, despite not being able to use your own graphics, Zanifesto's library of icons provides a decent selection. Okay, maybe a chart isn’t exactly the same as an infographic. But, given the interesting selection templates made available by Google, we would be remiss to exclude it. We'll admit that some features of Google Charts might be a bit more advanced than the other resources we’ve listed. But, if you’re ready to step up your visuals game, give it a try. There's no shortage of resources when it comes to creating your own visuals -- charts, reports, and infographics. And, depending on your budget and needs, there's a veritable plethora of options available, all of which have their pros, with very few cons.